The chairperson of Esel-Initiative, Stefanie Christmann, spent almost four weeks in Nepal to assess the project in Upper Mustang and the northern region of Lower Mustang. To offset the detrimental effects on the climate caused by the airline flight, a donation was made to www.atmosfair.de. Stefanie paid her own travel expenses. Upper and Lower Mustang were our first project areas in Nepal. In the autumn of 2007 and 2008, we allocated local cows in Upper Mustang, and in the autumn of 2007, we allocated local cows (90 €) and Jersey crossbreds (380 €) in Lower Mustang. Four years later it has become evident that local cows are the better choice. While some of the mothers who opted for a Jersey crossbred, e.g. Otar K. from Taglung, have a higher income than mothers with local cows, keeping the Jersey crossbreds is difficult for many as feed requirements are high, the cows find the terrain difficult and the women have to decide themselves when the cows should be brought to the bull. The owners of local cows have considerably more calves and thus more milk and they do not have to worry constantly that their cow might break a leg and die. As the owners of local cows are very satisfied, we will in future allocate local cows when the mothers of a region take the option for cows in general. In these few years, the mothers were able to dramatically improve their living conditions by selling milk and dung from local cows. While still working as day labourers, they were able to accumulate considerable capital with their calves and increase the cultivation of food. They spent less time and energy searching for fuel. They purchased warm clothing and shoes. Many were able to save enough money to buy a butter churn (3000 rupees/30 €). Almost all children go to school, many to fee-paying schools or in town because the village school caters only up to year 3 or 5. Their children’s health has definitely improved – the mothers and the voluntary social workers, such as Pema B., unanimously agree. For many mothers, dung is even more valuable than milk. Using dung as fertiliser, Tseti D. from Lo Mantang was able to grow enough grain to last her for 8-9 months instead of 4-5 months as before. 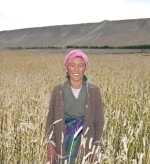 Tsemi G. from Tsarang was able to increase her grain harvest from 160 to 260 kg using dung to improve soil fertility. And widows who own land, such as Chisi A. from Lo Mantang, were able to lease additional land. Chisi, a mother of three, now has enough grain for 7-8 months. Leasing prices differ from village to village; often they are quite low or the lease is for free as rich families migrate to the city. The mothers grow buckwheat, barley, wheat, potatoes and mustard (oil production) in rotation and the grain provides them with straw, which they need for the cattle in winter. Several mothers are now also growing vegetables for their families. Without dung this was not possible. The rest of the dung is used for cooking. For Dolma T. from Choessar, for example, the remaining dung from her cattle saves her one month of hard labour every year collecting wood and dung. However, burning dung instead of using it as fertilizer can deplete the fertility of the soil. Two mothers whose cow and calf had died during birth borrowed money to buy another female calf. The fact that they took the risks involved in borrowing money shows that local cows are obviously the right choice of animals in Upper Mustang. They would have never considered purchasing a cow on credit before the project was introduced here. By now, most mothers in Upper Mustang have one cow and several calves. The first three calves have already given birth again. Diki G. from Lo Mantang even got a female calf from her first calf. Diki must leave her parent’s home when her brother returns to the village. Her cattle are her security as she will then probably have to pay about 1000 rupee/month in rent. Usually, local cows have their first calf at four years of age, so by 2012, several mothers will have two cows and will be able to sell some of their animals. To get the entire cattle “herds” of Doka G. (four animals), Dolma T. (five animals) or Fu D. (four animals) on camera, meant dancing between fresh cow droppings with the occasional misstep – but it was nevertheless an overwhelmingly joyful occasion for me and the proud owners. Single mother Doka G. could not afford to send her son to school before she received her cow. Now her 13-year old boy is attending year 3 in school. Doka is saving all her income from selling milk and schurpi (hard cheese) to ensure that he can go to school as long as possible. Dolma T., a single mother with one daughter, who received her cow in 2007, married three years ago. Her husband has to provide for the small child from her marriage, while all income from her cow is used or saved for her daughter. Dolma’s cow produces 3-5 l of milk every day; Dolma makes 900 rupees/week selling butter. This is quite a high income from butter. Mothers with several children often produce butter and schurpi just for their own use. Their children’s health takes priority over an additional income: For example, the women could sell their butter for 5-600 rupees/kilo and buy cheap butter from China (400 rupees) for their own use, but all the mothers I met only sell their surplus. “We now give our kids fresh milk and much more butter than before“, they proudly explain. Several mothers want to sell their first male calf next year. For a four year old bull Chinese buyers will pay 5-6000 rupees. In China, demand for fresh beef is high, whereas most Nepali do not eat beef for religious reasons. Information about this new source of income has found its way into the most remote villages, such as Chunjung and Samsung. It is possible that due to high demand from China where cows are slaughtered, the price for local cows could increase. We also used the visit to our project to find out if there are any single mothers of small children in the villages, who have not received a cow because their husband had been alive in 2008 or because at the time they had no children. Our local co-operation partner Sahayog Himalaya-Nepal (SHN) will purchase and allocate animals as soon as possible. In some villages, where there is little grassland, e.g. in Gilling and Choessar, it is hard for the mothers to collect enough fodder for the winter. In these villages, there also are less calves born than in places with good fodder growth such as Tsarang. We will try to introduce more fodder plants with durable roots and renewable fuel material (instead of dung) in these villages and will provide an update in a future travel report. More fodder will increase the milk yield and make it easier for the women to get their animals through the winter. During the months with snow, the animals are kept in the lower sections of sheltered farmyards, often owned by more wealthy farmers who support the single mothers. Many of the women also wrap the small calves in a felt blanket. The first mothers have extended their activity beyond the agricultural sector: After she had received her cow, Döka G. from Tsarang first rented a teahouse where she sold milk- and butter tea. Last year, she built her own house and her own teahouse. Karsang A. from Phutak opened up a small restaurant (bhatti) for locals. Some of the women built their own house and Tamdin’s house in Samsung (travel report 2008) has also been completed and she has moved in. Only two of the mothers in Choessar are still living in caves, the others are all able to pay rent. I met six of the midwives we sponsor and the amchi Pema D., who is now 26 years old. 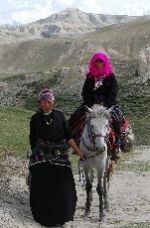 Pema has supervised over 20 deliveries north of Lo Mantang and also travels on horseback to visit her patients or to collect medicinal herbs. By coincidence, we also met Kessang G. from Thinkkar, who attended our first midwifery training. 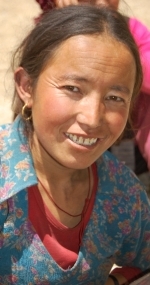 She was transporting a patient from the health centre in Lo Mantang back to the village. The patient was so weak that Kessang had to lift her onto the horse. Kessang is responsible for an extensive catchment area: Kimling, Puwa, Thinkkar, Namgyal, Nemdal and Chunjung. She had already worked as a midwife before she attended the training but during the training she discovered the importance of a sterile birth environment, correct hand washing and health counselling for pregnant women. In the training, she learned how to listen to the baby’s heartbeat and how to properly cut the umbilical cord. Since completing the training she has supervised four deliveries and organised the transport of a woman with a foreseeable high-risk delivery to the hospital in Pokhara. Other midwives also told us that they did not know how important hygiene is during delivery before they attended the training course. In some villages in Upper Mustang, one in ten women die - not during birth but as a result of infections after the delivery. The trained midwives instruct a pregnant woman several months before the delivery date how to prepare a clean birth environment. Several small and very remote villages are included in the midwifery training programme. Tenji P., a 28-year old woman from Sancta, for example, is responsible for two villages with only about 90 inhabitants. However, it takes two travelling days to reach the next health centre, too far to walk for a pregnant woman. Tenji has already attended one delivery: “All went well!” She said that both villages are delighted to have a midwife even if there are not too many births. This summer, SHN carried out the second midwifery training for 24 women, seven from Myagdi and 17 from Helambu/Langtang. Horses are to be allocated a soon as possible. Unfortunately, the women from Dolpa could not be invited for logistic reasons, but midwifery training will also be available for them in the future. Diki G. now has a cow and two calves, one of them female. Together with her daughter, the young mother is still living with her parents. But after their death she will most likely find herself without a home. Her cow produces 3 l of milk/day. Yangdzin L. will now receive a cow. This very poor single woman is looking after the 8-year old daughter of a neighbour, who left the village after the girl’s birth. At first, Yangdzin bottle fed the infant. This is quite unique in Upper Mustang. Diki G. will also receive a cow. She has two small children attending school and she possibly has a serious lung disease. She is unable to work as day labourer. Fu D. has now four cattle! After her cow and calf died during birth, Nima R. bought a female calf on credit. Döka G. built her teahouse, presented here by her little son, all by herself. Tamdin D. from Samsung has made it: In 2008, she had just started to build her house. Now she is living in it and her cow has a female calf. Doka G. with her cow and her three calves. Doka G. is just as proud of her cattle herd as she is of her wheat field. Three months before our visit, Lamu G. was still living in a rock cave above Choessar. Now she can afford to pay rent. We met midwife Karsang A. while she was transporting a patient. Midwife Tenji P. works two travelling days from the next health centre.